With loom bands being very popular at the moment, 6yr old Miss M was thrilled to receive the Cra-Z-loom bracelet making set from Hobbycraft. 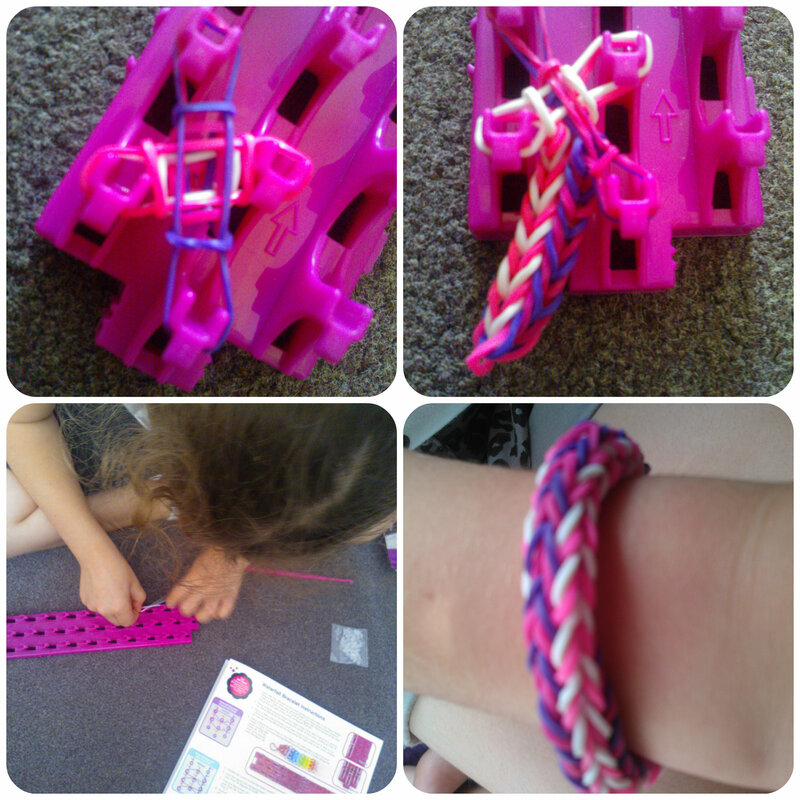 Previously she has only attempted basic loom bracelets on her fingers so we were keen to try some more intricate patterns using the loom board which comes with this set. The kit includes 1 loom, 1 weaving hook, 600 assorted rubber bands, 25 ‘S’ clips and an instruction leaflet. The instructions are simple to follow showing you how to make three different bands, a single loop bracelet, a waterfall and a bridge style. 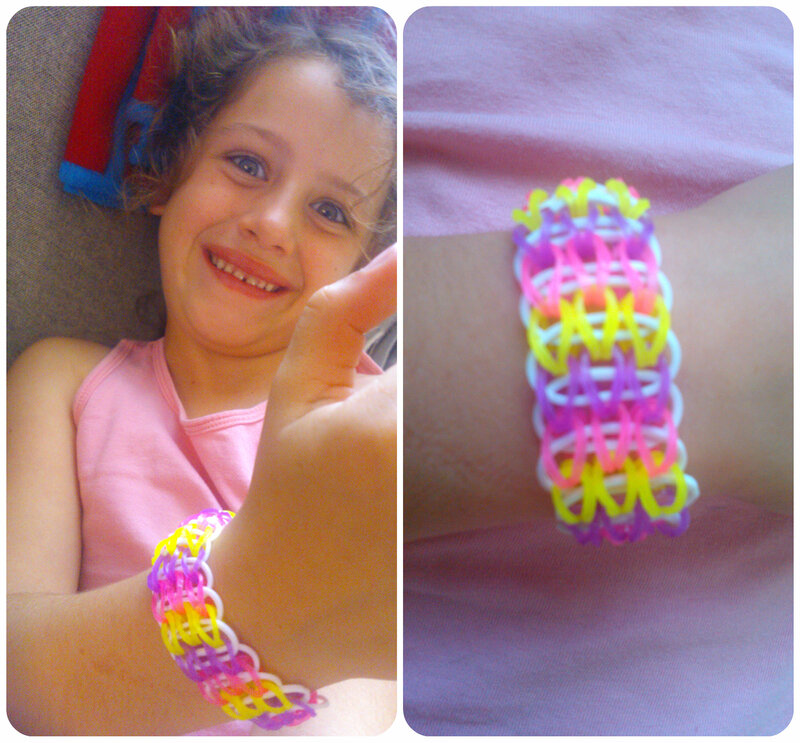 Miss M was keen to have a try and started with the single loop bracelet. After me starting off the pattern across the loom and showing her where to place the bands, she was soon off doing them herself. The loom seems like a good strong quality and was easy to hang the bands over. Once all the bands are in place you then have to use the hook to loop certain bands ones over each other to complete the pattern and then the bracelet can be removed from the loom. 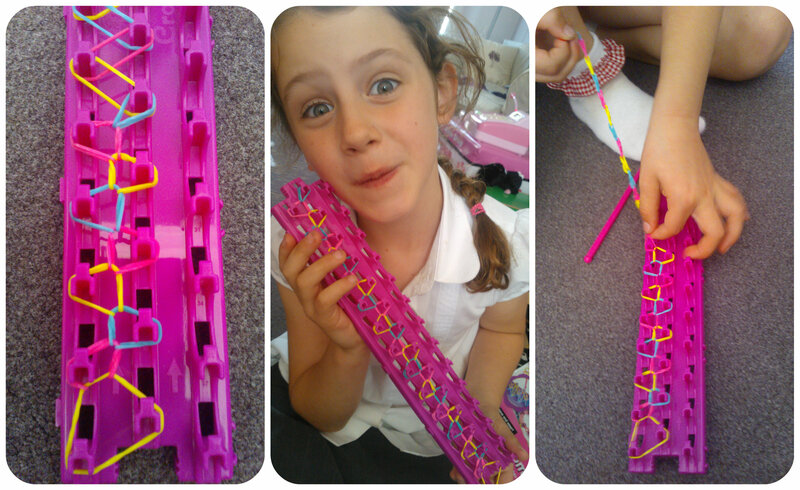 We then tried a four sided loom bracelet using just four of the pegs on the loom band. Miss M really enjoyed this and was thrilled with the result, a lot thicker and more defined bracelet that looked much sturdier than the basic single loop bracelet. Miss M then looked through the instructions and challenged me to make her the waterfall bracelet. The instructions for the loom are quite clear and are illustrated to help you know where to place the bands and how to hook them over. It took me a few tries to get the hang of where I was placing the bands for this one and hooked them over incorrectly at first, but once I got going, it is actually relatively easy. Miss M would need guidance to make one of these but it’s definitely something she’s aspiring to make soon. We thought the waterfall bracelet looked really effective and Miss M couldn’t wait to show it to her friends. The quality of the contents of the Cra-Z-loom set are good and the instructions are a good starting point to make a few different designs of bracelets. Miss M could follow the more simple designs on her own and with some guidance from me we are moving on to more complicated designs. The loom and hook seem strong and durable, and with a big colourful bag of loom bands included, we’ll hopefully have many more delightful bracelets being made over the next few weeks. 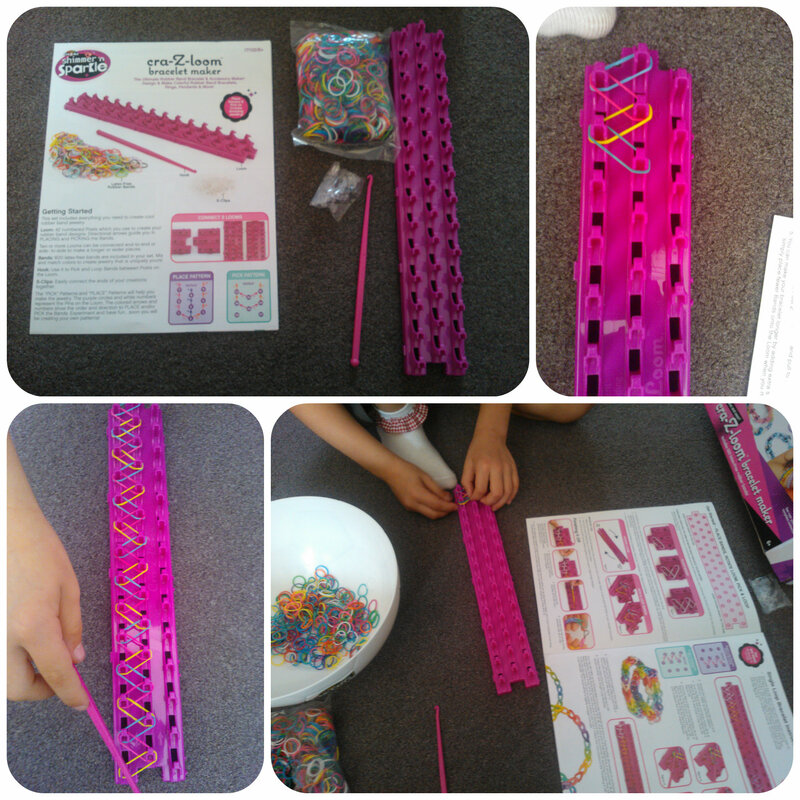 Both Miss M and I have really enjoyed the Cra-Z-loom bracelet kit available from Hobbycraft. The possiblities with loom bands is endless and we look forward to discovering other interesting designs and ideas to make with them now that we have a loom to work on. Have you tried the new loom band craze yet? All reviews are my own and my family’s opinions and the Cra-Z-loom was sent to us in order to write the review. 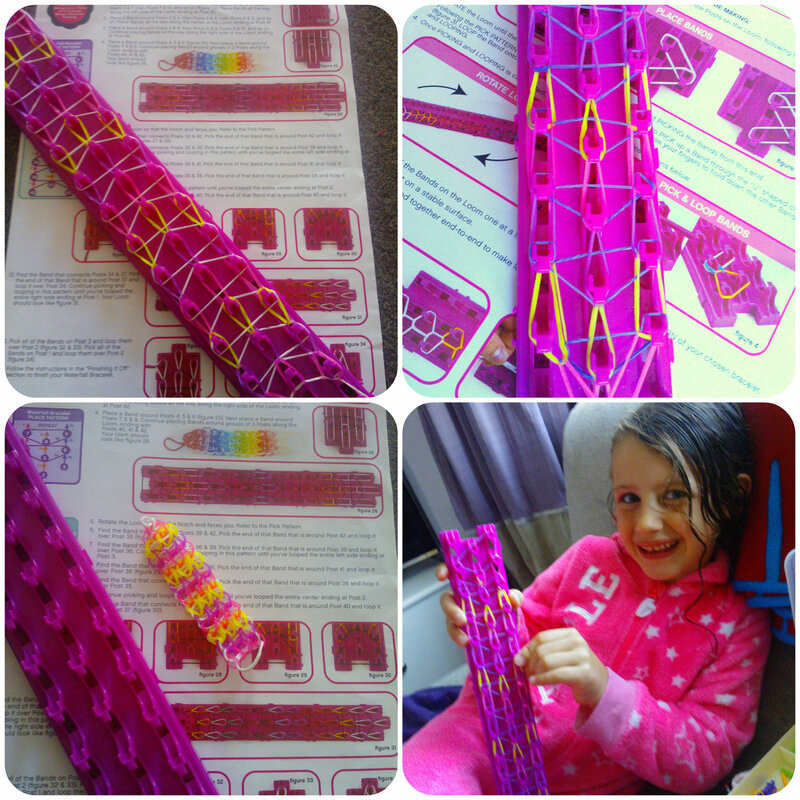 This entry was posted in Reviews and tagged bracelets, cra-z-loom, craft, hobbycraft, loom, loom bands by Fiona Martin. Bookmark the permalink. 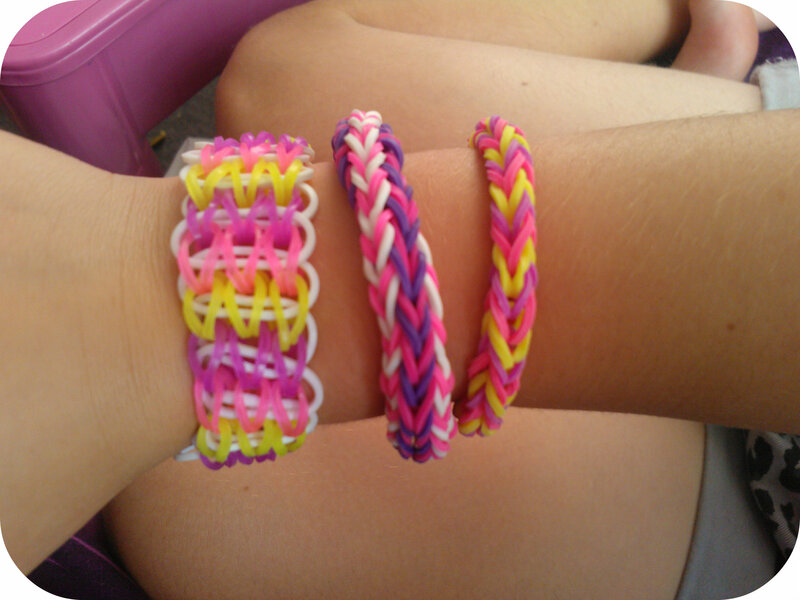 I’m not in to loom bands at all. I think hoovering them up is driving me crazy LOL but it’s amazing to see some of the things people are making with them. I’ve seen characters from Frozen, a panda and even a jacket! My son loves making his loom bands, and we have tried various things on the loom, but he keeps going back to making them on his fingers! Your daughter is cleverer than me. I can’t get on with the loom, prefer my fingers. That looks great. My son has just got into loom bands and I know he would love something like this!